My new job in the army as a Chopel, or Company Medic, came as a pretty sudden surprise to me. My previous commander sat me down, and told me, “Max, you’re leaving the infirmary in a week and a half, and going to be a Chopel for the soldiers in training. Also, there’s nothing you can do to change this.” So I did as any good soldier would do in my situation, I put on a half smile, said “Ok,” put my head down, and slowly sulked away. I was disappointed, because I had just starting feeling like I was getting the jist of being a medic in the Infirmary, and even more significantly, I was close with my friends from there, so changing jobs would mean starting from scratch with everything again! But alas, I had no say in the matter, so I went back, talked with one of my closer friends about it, and then went to go tell the rest of them. I was upset, but determined to make the best out of it.Fast forward to today, three weeks later. I have to say, I’m not having a bad time at all. Something unique about my service is that I really have had an opportunity to experience many different aspects of the military. I spent three months on a base learning Hebrew, finished basic training with an elite unit, completed the combat medic course, jumped out of an airplane after a two week parachuting course, served as a medic for my unit in the infirmary, and now my current job as a Company Medic. Most soldiers don’t get to experience so many areas of the army in their entire service, and I’m only half way through. What is especially cool about my current job, is that while my soldiers have very strict rules about where they have to be, what they are allowed to do, and when they are allowed to do it, I don’t. My main job is to be available in case I’m needed, as a result, I get to travel all over the country with my soldiers, and I can manage my own schedules. For instance, yesterday, we arrived near Be’er Sheva around 10:30pm after a 5 hour ride in the infamous AC-less Hummer. At this time, the soldiers had to start a 6-7 hour navigation exercise. I was pretty wiped just from the ride, and since I only needed to be available but not actually active, I slept like a baby in the incredibly [cramped, and not so] comfortable jeep, while we followed the soldiers on their night time navigations. This turned out to be very convenient for me, because it allowed me to have a very exciting and action packed morning. At 6am, I was woken up upon our arrival to a Kibbutz in the area that had graciously agreed to let us sleep in an empty and abandoned bomb shelter, which the soldiers had set up for sleeping before they headed out on their navigations. I decided this would be a good time to go for a run as it wouldn’t be too hot, and later in the day was projected to be (as I’m writing this is) 96 degrees Fahrenheit. So I organized my things, brushed my teeth, and set out for my run. 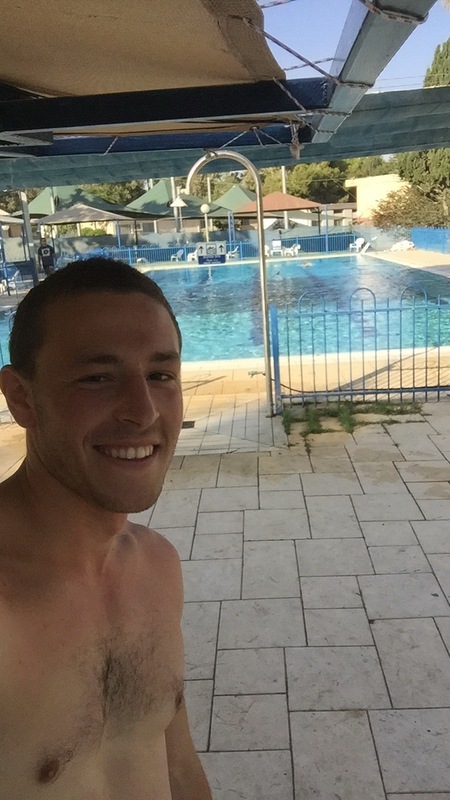 As I reached the end of my run, I found that the Kibbutz pool had just opened, and since it was only 7:00am, there was only one other person at the pool. So, as any good soldier would do, I half smiled, said “Ok!” and walked right in. I didn’t have a bathing suit with me, but I made an executive decision that my boxer briefs would suffice. After getting totally exhausted from 20 minutes of swimming laps in my underwear (the old guy who outswam me by a factor of three, made fun of me over it) I got out, showered, and got dressed, with an incredible start to my day already behind me. Probably the only time I’ll ever wake up in the army, and go for a swim first thing in the morning. It’s really easy to look at a situation, say “Damn, I got screwed over here pretty badly, huh?” and then continue sulking. However, if you can look from a slightly different angle, and be able to appreciate the good instead of just the bad, then that’s called winning life. Life is not a competition, it is just something that happens to people, and we just have to have a good time while it’s happening to us. So winning in life isn’t about doing well compared to others, it’s about making the best of your situation, whatever that might be. Next Want to retire a millionaire without doing any work?